Wednesday May 22nd 1878 Mother went to the valley today We ironed baked bread and did the work generally it took the whole day. Aunt Lida, her mother and Eddie stayed here all night. Mr Aldon came real unexpectedly tonight. We were glad to see him. I had a letter from Kate. Thursday May 23 1878 It was terribly warm today. Mother went to town with the folks. I did up the work and baked three cakes. I was busy sewing in the afternoon. I went to town after supper and after I come home talked to Cattrell till bed-time. I had a letter from Louise. 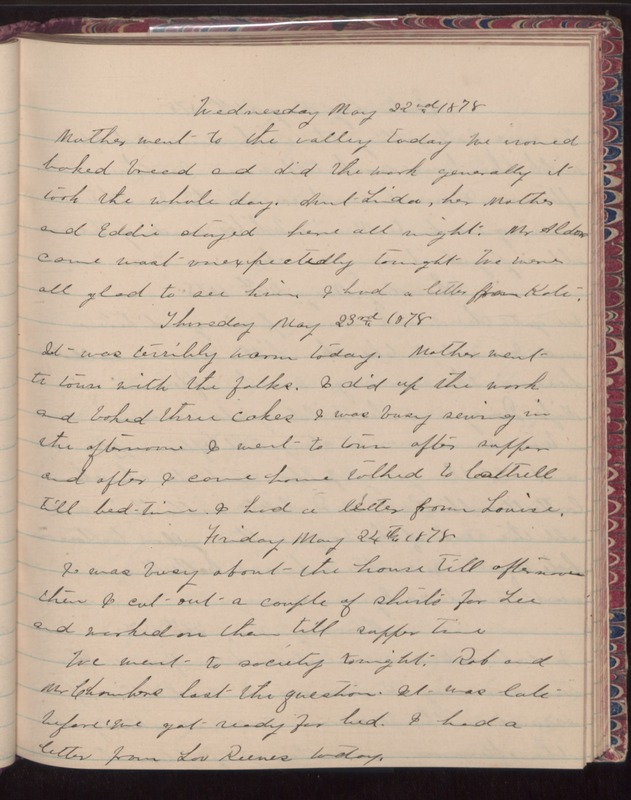 Friday May 24th 1878 I was busy about the house till afternoon then I cut out a couple of shirts for Lee and worked on them till supper time. We went to society tonight. Rob and Mr Chambers lost the question. It was late before we got ready for bed. I had a letter from Lou Reeves today.